I have a friend who’s made it his life’s work to master every hyper-annoying character in competitive video games. When Overwatch first came out, he made a beeline to Junkrat. Ever since, I’ve looked upon the simpering trash gremlin with scorn and strife. Today, I’m humiliated to admit that I was wrong. As part of my recent quest to play every hero (and inspired by Overwatch League wunderkind Jake “Jakerat” Lyon), I’ve spent the past few weeks spending increasing amounts of time with Junkrat. At first, I was only planning to main as him for a few evenings, but after getting over the garbage-strewn learning hump, I realized a grim and terrible truth: I’m having a fantastic time. I used to think Junkrat was nothing but an irritant. When he dies, he farts out a cluster of live grenades that’ll take you to trash hell with him if you’re not careful. As a newbie player, I used to absent-mindedly stroll into those grenades all the time, instantly dousing my sweet, sweet victory in spoiled milk. The worst part was that I couldn’t even get that mad at enemy Junkrats when it happened. My rage simmered until I realized I had only myself to blame. The grenades were there every time. My own idiot brain compelled me to walk into them. Junkrat, an oblivious explosion addict, forced me to face my own failings. And he did it by basically saying “stop hitting yourself” until I finally stopped hitting myself. The other day, I got a team kill with it, single-handedly stopping the other team’s first point push when nobody else could. It was an incredible feeling, bolstered by the fact that I had to cleverly maneuver my tire to pull it off. It was like an on-the-fly stealth minigame, only it ended with a massive, game-changing explosion. Junkrat laughed. I laughed. The other team wept. Joy, I have learned, suffuses every part of Junkrat’s kit. He can toss down mines and detonate them to propel himself into the sky, and it’s a thrill every time. As he lobs grenades every which way, he cackles maniacally. Each time somebody steps into a trap he’s laid down, it’s a fun little surprise. Who have you caught this time? Who do you get to blow up? Is it Tracer? Please be Tracer. Even death has a chance of being fun in an unexpected way. If you keel over in close-quarters, your opponent might not have time to get away before your posthumous grenade cluster goes off. Or maybe they’re just stupid, like I used to be. Either way, there’s nothing better than instant revenge. There are so many little nuances in the way Junkrat plays, too. It’s a great feeling to find the perfect route to flank a team and grenade-spam them until they’re in front of their own shield, helpless in the face of your team’s focus fire. You always get to be so crafty and conniving. Then there’s Junkrat’s up-close combo: turn in the enemy’s direction, throw a mine in their face (a multi-button combo with a glorious rhythm to it) to create space, grenade, grenade, grenade. At first, it’s an awkward process that requires more inputs than your average Overwatch attack, but once you get a feel for it, it’s practically reflexive. 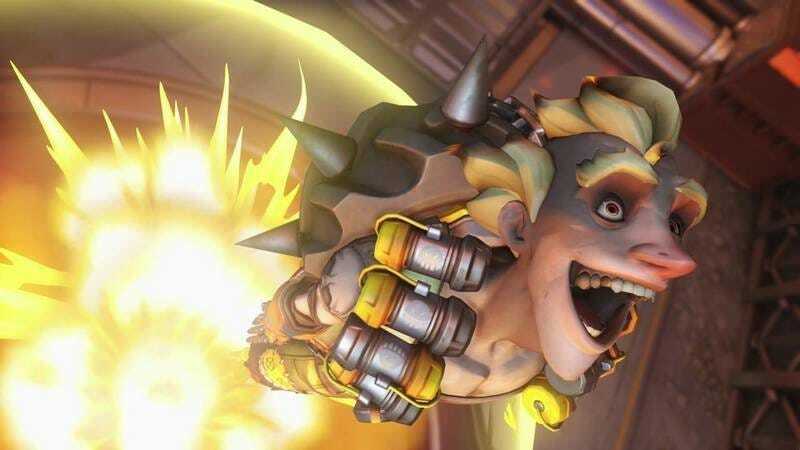 So many people see wiry little Junkrat—the Gollum of the Overwatch universe—and think he’s easy pickings if they just get up in his face. Proving them wrong is so delicious that it should be its own ice cream flavor. I used to find Junkrat’s constant laughter to be the most annoying thing in the world, but I get it now. Junkrat laughs because he’s having the time of his life 24/7. Sure, a lot of that fun is coming at other people’s expense, but he’s teaching valuable lessons—like how not to step on grenades—in the process. He’s doing you a favor, in his own way. You can accept it or reject it. Regardless, you’re not gonna rain on Junkrat’s parade. So you might as well embrace the rat, become one with the rat, look in the mirror and see that sawtooth smile and those beady little shark eyes and recognize that this is who you were all along. Finally, you’re ready to love yourself.